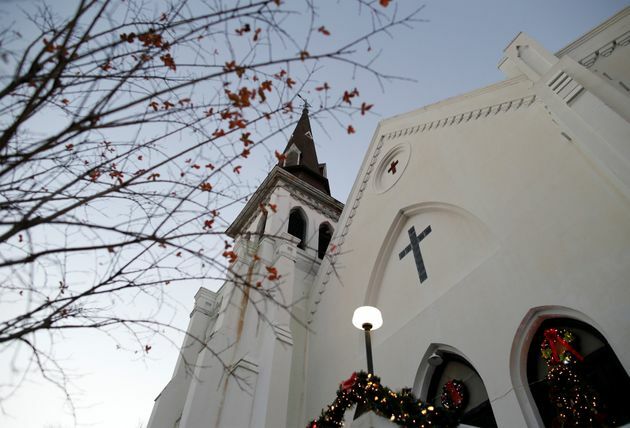 Christmas decorations and a small tree frame the Mother Emanuel AME Church after the federal trial of Dylann Roof who was found guilty of 33 counts including hate crimes in Charleston, South Carolina December 15, 2016. Dylann Roof has decided to represent himself in front of the jury that will decide whether he is to live or die and forego the assistance of the skilled capital defense attorneys that represented him during the guilt phase of his trial. His reasons for going it alone are unclear since the court hearings on the subject have been closed to the public. Roof may have delusions of being a martyr for the cause of white supremacy, or perhaps he does not want evidence of mental illness to be brought to light. Whatever his motivation, the judge has ruled that Roof has a right to represent himself because the Supreme Court has said that the Constitution generally provides an accused the right to be his own lawyer given that it his fate at stake. This idea of the right to control one’s fate echoes a romantic vision of those who settled America as self-sufficient individuals willing to stand up to the Government on their own. This notion is perhaps appealing enough to tolerate the reality that representation by counsel is sometimes the difference between whether a defendant goes free or goes to jail. But to allow self-representation at the penalty phase of a capital case is constitutionally perverse, as it ignores the rights of the often-overlooked individuals who play a central role in the death penalty drama ― the twelve jurors who must decide his fate. They are the ones to whom the Constitution assigns the immense responsibility for deciding if the defendant morally deserves to die. Jurors often feel betrayed in cases when they later learn that a defense lawyer’s ineffectiveness meant they did not hear compelling evidence about a defendant’s mental illness or abusive childhood. These jurors have done nothing more than answer a jury summons and promised the court that they are capable of weighing whether to impose a life or death sentence. In return for that promise, however, the criminal justice system also made an implicit promise – that before they are asked to make what many jurors regard as the most difficult and heart wrenching decision of their lives, they would be fully informed about the person whose fate they hold in their hands. And jurors understandably want to know a host of facts – is the defendant intellectually disabled? Does the defendant suffer from a mental illness? Did the defendant have any spiritual or moral guidance growing up? Was the defendant subjected to excruciating sexual, physical or mental abuse? And lest one think that none of these facts would matter to a jury given the horrific nature of Roof’s crime, remember that a Colorado jury recently chose life over death for James Holmes, who killed twelve and wounded seventy people in a movie theater. That jury decided the ultimate sanction was not justified because of Holmes’ severe mental illness, information that a jury might never have heard if Holmes had decided to represent himself. The Supreme Court has justified the current death penalty regime on the premise that the jury will act as the conscience of the community. Jurors can only carry out this sacred function, however, if they hear all of the evidence, both for and against imposing a death sentence. Jurors often feel betrayed in cases when they later learn that a defense lawyer’s ineffectiveness meant they did not hear compelling evidence about a defendant’s mental illness or abusive childhood. And well they should. The justice system asked them to make a profoundly difficult moral and spiritual decision and then failed to give them the information that they needed to carry out their mandate. In Roof’s case, the court may believe that its ruling furthers certain values, but it has missed a far more important constitutional principle: a death sentence should never be imposed unless we have complete confidence that the jury’s decision is a reliable and knowing one based on all of the facts. With Dylann Roof representing himself, that outcome is simply impossible. We owe it to the jurors and to ourselves as the society for whom the jurors speak that they hear all about Roof’s life before we ask them whether he should be sentenced to death.